Dr. Bobby Nibhanupudy is a board certified surgeon experienced in kidney and pancreas transplant and laparoscopic surgeries. He joined the AdventHealth Transplant Institute, formerly Florida Hospital Transplant Institute, from the Kidney Transplant Program at Bert Fish Medical Center in New Smyrna Beach, Fla., where he served as Co-Director and Primary Transplant Surgeon. Formerly, he was an Assistant Professor of Surgery in the Division of Transplantation at the University of Texas Southwestern Medical Center. Dr. Nibhanupudy performs operations and sees patients post-transplant to ensure proper healing is taking place. 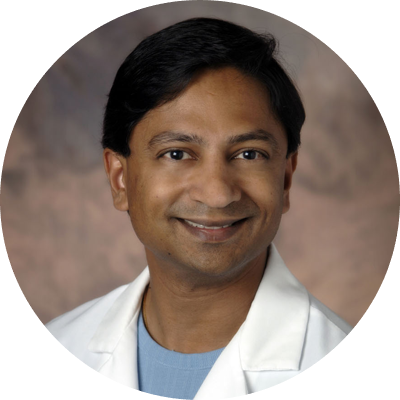 Dr. Nibhanupudy was Chief Resident at the University of California San Diego Medical Center. It was at UCSD that he completed his fellowship training in abdominal transplant surgery. He received his medical degree from Howard University College of Medicine, Washington D.C.
Kidney and pancreas transplant and laparoscopic surgeries.